I was planning a video (or two) on provisional cast-ons for this week*. But then I came across four or five mentions here and on our Raverly thread made by crafters who have decided to give spinning a try. Well. Since one of my nefarious plans is to turn all my readers in to spinners I had better nurture that hadn’t I? Before I get started with a new spinning project, I test out the fiber to see how it drafts and how it takes twist. This testing exercise is something I make all beginners do when they come to learn spinning. Its easy and fun and a good introduction to the two big parts of spinning: drafting and twist. All you need is the fiber. No spindle or wheel required. You simply draft out a length and then roll it down your thigh. The drafting part will teach you (and your hands) how gently or forcefully you need to pull on those fibers and how long the fibers are. The rolling-down-the-thigh part teaches you how much twist the fiber needs to become yarn. But this is good for more than just beginners. Every fiber drafts and twists differently. 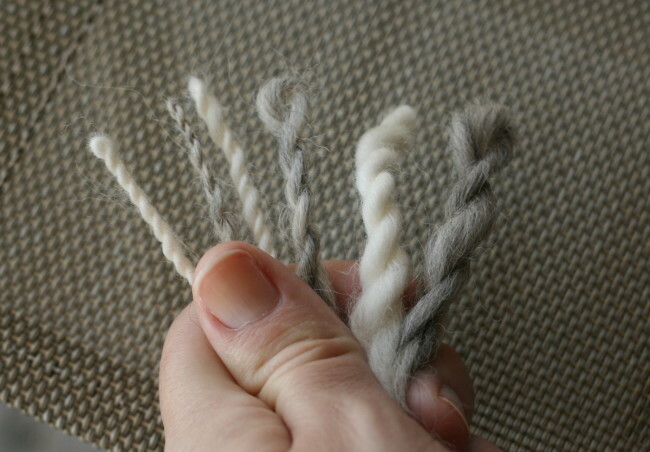 In the picture above, the gray is alpaca and it doesn’t take the twist are readily as the white polwarth**. 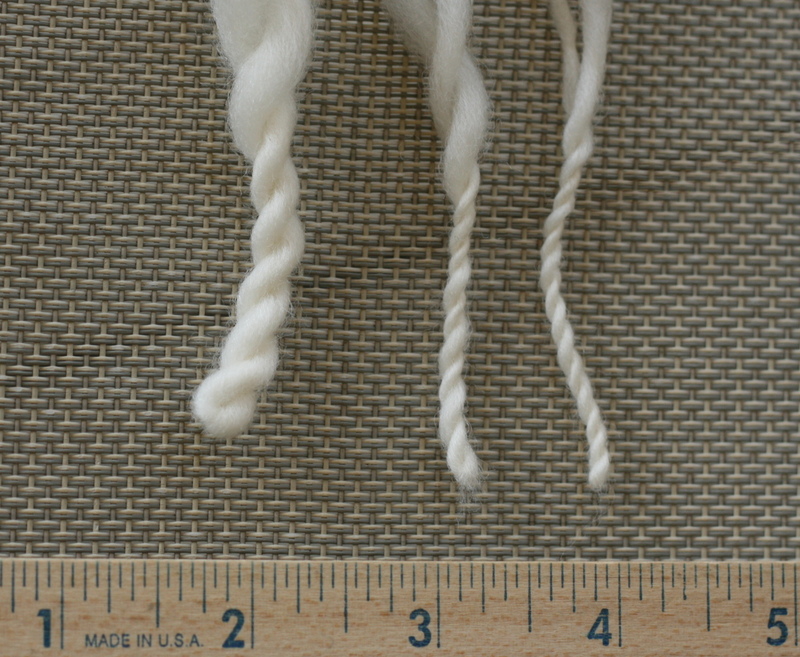 Also different thickness, different weights of yarn require different amounts of twist (of course, lol). For me each fiber has a sweet spot. I go through this exercise looking for that certain draft thickness and certain amount of twist that the fibers seems to naturally want to be. If you spend a few minutes testing your next fiber you might be surprised at how it “behaves”. Hope you find this exerciser as useful as I do! 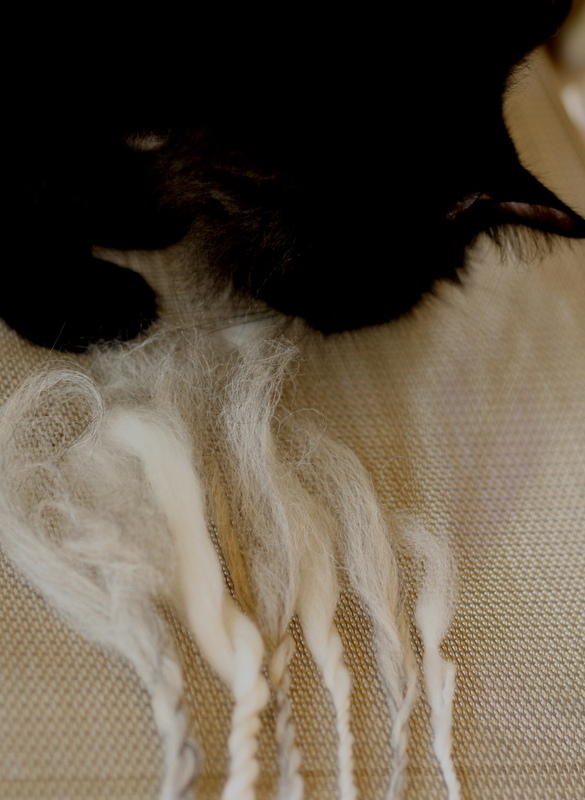 Oh and, no, I did not forget to include the obligatory, Anti-Spinning Feline Overlord messing with the fiber picture. She was on the ball and conducting her inspections, never fear. * We’ll do provisional cast-ons next week. I pinkie-swear it. **Polwarth is a hybrid breed developed in the late 1800’s and its been gaining popularity of late. The intent of the breeders was to combine the softness of the Merino breed with the and the longer staple length of the Lincoln breed. The result is very nice. If you haven’t tried it yet you should! Paradise Fibers and The Woolery both carry it. 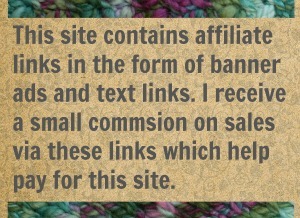 9 Comments on "Sunday Stitch – Testing a Fiber Before You Spin"
I love this idea! I would love to see a really in-depth series because I am the beginning of beginner spinners and you are using jargon I don’t recognize (like draft, and some others I cannot remember). Or I would totally a recc on a good beginning spinner book too! Okay. I’ll have to get to work on that! If you start out with a spindle (which I absolutely recommend), “Respect the Spindle” by Abby Franquemont is the best book out there. Abby is a wonderful teacher and she probably knows anything that is to know out there about spindle (and wheel) spinning. Ahh, but you have a special challenge I think. 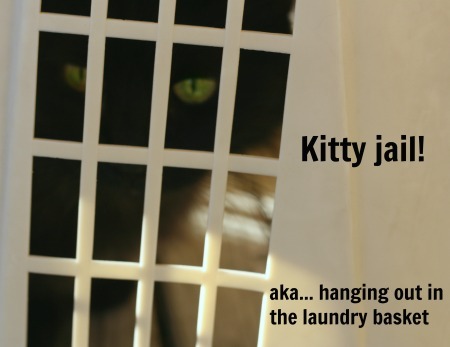 You have a animal fiber allergy and only spin cotton, right? This drafting method works if the cotton has been prepared for handspinners, if its a been prepared like as a sliver or in those cotton punis. If you have that prep for commercial gins, which I call ball of lint, this might not be so effective. I am NOT a spinner, but I love to watch others! My grandmother did and I could watch for hours just like your kitty! 🙂 Great job on the tut. and photos. I’ve met plenty of people that enjoy watching someone else spin. They say its relaxing, like watching a fire. Maybe I should post video of just me spinning. Maybe that would put everyone to sleep, lol.